The Hunter 9700 is much more than just our wheel balancer. We consider this machine one of our more useful diagnostic tools. 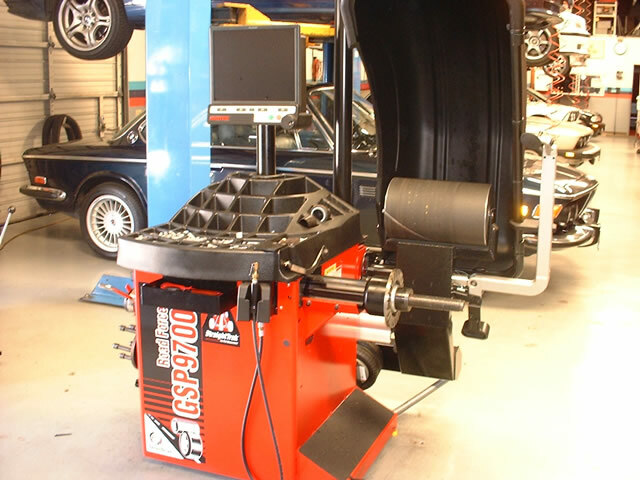 Prior to any wheel balancing, this machine is used to perform an array of tests that qualifies every tire & rim. Rim offset and back space measurements – to insure the rim is the correct fit for the car or is in the correct position on the car (i.e.- staggered rims). Rim center hub measurement – to determine if the rim mounting flange is true. Lateral & radial rim measurement – to determine if an acceptable minimum amount of runout exists (i.e. hop or wobble). Match Balance Measurement – to determine the correct tire and rim positions as mounted together for the least amount of balancing weight and tire/rim run out. Straight Track Measurement – to determine the amount of drag/pull each tire will generate when in contact with the road. For non-staggered wheels the 9700 will also recommend the optimal wheel installation position to help eliminate a very common problem called “radial tire pull”. Road Force Measurement – to calculate wheel vibration as simulated when the tire is in contact with the road. A recommendation for the tire to be rotated on the rim to cancel out vibration may be required. All tests are performed with the rim attached to the machine by means of a specific BMW rim adaptor with the correct lug bolt hole spacing (see picture inset). 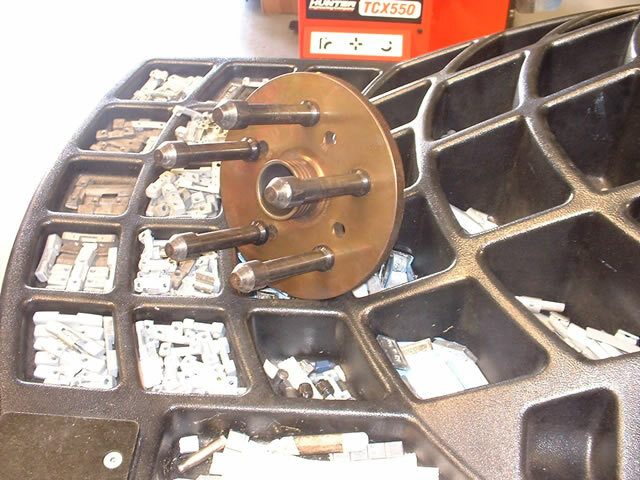 This eliminates the inaccuracy associated with a generic mounting cone as used by many tire stores. Final wheel balancing is accomplished in a non-round off mode of weight measurement. In other words we do not allow our machine to average wheel weight calculations as most shops do. This results in a wheel that is zero balanced (instead of a possible + or – 10 grams off). As a final step of accuracy, our 9700 indicates each wheel weight position on the inner and outer portions on the rim with a laser pointer. This ensures very precise weight placement without the usual method of lining it up by eye. Most drivers are unaware of damaging vibrations and imbalance that exists ever so slightly after the typical mounting and balancing of tires. Until the steering wheel has a noticeable shimmy, it’s hard to understand there was an on going problem. By then there is either irreversible tire, rim or suspension wear. In the hands of our professionals, our enhanced version Hunter 9700 will produce tires that are smooth rolling and will wear evenly. Your BMW with feel like it should but more importantly, you will stop damaging expensive tires and suspension components. 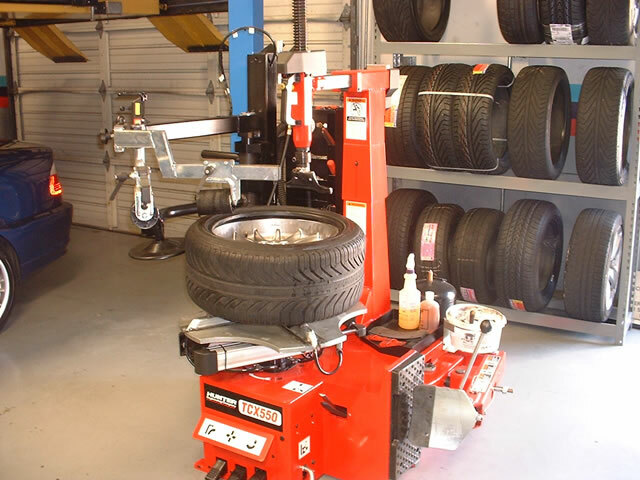 The Hunter 550 Tire Machine is a powerful piece of equipment for dismounting/mounting tires. It never camps the rim from the center hole or hub. Rims are clamped from the inside of the inner portion of the rim or from the outside of the inner rim edge with rubber coated clamps. It peels tires (even difficult run flats) from rims with out damage to the tire or rim. Proper clearances, as well as Teflon inserts at key points of contact on the machine arms protect the rims from any scratching. 3 individual roller arms depress, lift and roll tires on the rim with little or no amount of prying on the tire or rim. As automotive trends have favored lower profile tires, the tire sidewalls have become stiffer making dismounting and mounting more challenging. Most people worry about having their rims scratched but don’t realize that those tuff rubber tires can also be permanently damaged during the dismounting or mounting process. This will affect how the tires roll and wear. Now, with the introduction of low profile Run Flats, the tire side walls are exponentially stiffer to function properly when the tire looses air. This translates into an extremely difficult job requiring this type of heavy duty equipment along with the finesse of an experienced machine operator to execute the job properly. Some tire side walls are so stiff that the tire has to be heated (in an oven) in order to make it pliable enough to mount on the rim. In addition to the manual task of dismounting/mounting tires there is also a technical aspect to the job that needs to be considered. Tire manufactures can be very specific with mounting directions for performance tires. Some tires require mounting so all the tires only roll in one direction. Some are designated with an inside or outside mounting position only and mostly all tires are marked for a specific valve stem to tire mounting position. With the introduction of Run Flats came the new EH2 rim design. This is a rim with an extra bead ridge on the inside of the rim to help retain the tire in position in the event of pressure loss. Proper mounting and care is required to ensure the tire is seated within the double bead surface. There are also Tire Pressure Monitoring System (TPMS) sensors that can be destroyed or damaged during dismounting/mounting. Some sensors even have I.D. coding and must be installed in the correct order on the car. As basic as tire mounting may initially seem it requires more than a minimum wage worker who is being rushed during every aspect of the job as is the case in most tire stores. Why compromise a part of your BMW’s safety and handling by using just anyone. Bavarian Machine Specialties offers the latest equipment and specific BMW expertise to provide solutions for your tire, rim and suspension needs.